Marx investigated and analysed the process of ‘globalisation’. Though he never used the term ‘globalisation’ per say of capital yet the underlying meaning is clearly discernable in the Marxian term ‘world market’ and ‘foreign trade’. 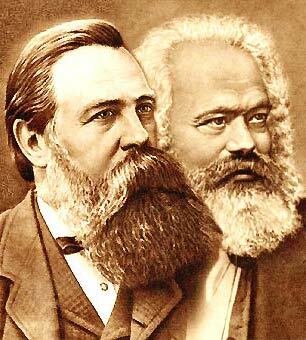 Both of them, being liberally used in the extant text of Marx (and of course also Engels). For Marx ‘capitalism’ represented a specific mode of production characterised by the separation of producer (i.e. the workers) from the means of production, based on wage, labour and capital. ....labour is the workers own life activity, the manifestation of his own life. And this life activity he sells to another person in order to secure the necessary means of subsistence. (Karl Marx and Fredric Engels; Communist Manifesto (CM), SW 1, Pg 111). Unlike earlier mode of production, the Capitalist Mode of Production takes the form of commodity. Labour subsumes under capital, and every occupation become a “paid wage labour” (Marx and Engels, Communist Manifesto, Pg 111) to the bourgeoisie. Here it is important to understand how the Capitalist Mode of Production differs from all the other historic modes of production that it succeeded. Where as in all the pre-Capitalist Mode of Production, the society was driven by need, CMP replaced it with exchange. To elaborate, a product in the pre Capitalist society was in demand for its value of utilization (or need) by the consumers, it is diametrically different case in the capitalist society. In CMP products take form of commodity. A commodity is an exchangeable product used to satisfy human need. Every commodity has an associated value associated to it. This value can further be sub categorized into use-value and Exchange value (or simply value). The utility the thing makes constitutes its use-value. Wher as the exchange value (or simply value) is proportion in which a certain number of use-values of one kind can be exchanged for certain number use values of other kinds. A common feature of all commodities is that they are “product of labour”. Each particular commodity represents only a certain share of “socially necessary ‘labour time’. The magnitude of value is determined by the amount of socially necessary labour for the production of a given commodity. Further for a commodity the exchange value constitutes the quantitative value and the use value represents the quantitative aspect of value. In determining the price of a commodity the use value constitutes the substratum of the price of a commodity. The value of a commodity consists in the fact that its owner relinquishes its own use value and pockets its exchange value. The pre capitalist social formation were characterised by use-value in CMP it is the exchange value which dominates, hence the Surplus Value (SV), that though present in all class divided society assumes a much greater significance. Whereas the surplus value can originate outside the sphere of production in pre Capitalist Mode of Production, where it represents essentially a transfer value (so-called primitive accumulation of capital) and is circumscribed by the approximate fixed cycle if needs. But under CMP where capital controls and dominates the sphere of production, it assumes significance, as it represents a constant increase in value. Thus it is only under CMP that exchange value replaces the need value. The production of surplus value was widely used by Marx during his course of analysis of Capitalist Mode of Production one finds its repeated use in Marx's extant text. The limitation of space prohibits us from going in detail of discussing about surplus Value which in itself constitutes separate topic of discussion. Let us recall that the hallmark of a Capitalist Mode of Production is the appropriation of Surplus Value. In all other previous modes of production, it was the use value and not exchange value which governed the production, but in CMP the use value is replaced by exchange value, hence unlike the pre Capitalist Mode of Production, the Surplus Value hence generated cannot be circumscribed. On the contrary the CMP the value of surplus Value assumes far greater importance and becomes the dominant theme. The capital can only generate more Surplus Value if it keeps itself in the circuitous motion. Marx's brilliant and much famed formula (M-C....P....C’ -M’) elucidates this motion. This circuitous motion can only sustain itself if the external trade develops and reaches to the ‘world market’. The external trade transforms the ‘market’ into ‘new market’. this develops the true nature of value of the surplus product. This world market changes the character of money that money now develops into world money while the abstract labour metamorphosis into social labour. As capital tends to create surplus value continuously, it creates complimentary poles of exchange, thus propagate CMP across the globe. The world market is therefore the pre-supposition as well as result of the capitalist production. Each limit from point of capital is an obstruction that has to be surmounted, even at the cost of the destruction of productive force. Thus capital tends to root out all other modes of production, that it comes to view as obstructionist in its incessant growth, hence it goes on a spree of destruction of all vestiges of the earlier society. Capital in its own course of temporal spatial development, strewn with plunder, enslavement, dispersion of masses perpetrated at a scale unknown to human beings sows its own seed of negation. The class it creates for its own development exacerbates its own nemesis. The proletariats stands directly confronting it and halting its death march to crate a new society. One hand the bourgeois society carries within its own womb seed of its own destruction; on the pother it creates the material foundation of a new society. The CMP is credited for the development of productive forces, which it has carried forward more than any previous mode of production. With all analysis of Marxism a central point that one should never forget is that Marx above all was an internationalist and a revolutionary. The academia and generally the resurgent Marxist academia of the first world while discussing the Marxian theory of capitalism; overemphasizes on the “economist” Marx, while forgetting the real Marx—the internationalist revolutionary Marx. Amidst their economic jargon and mathematical equations, somewhere the soul of Marx is completely neglected. The works of Marx and Engels above all their analysis and interpretation carries within itself the ultimate goal for which they were penned. The class anger, the historical program of awakening the working class from their slumber is today what is missing from the scores of papers produced every year from the numerous universities and research institutions. Economic Marxism cannot be isolated from its overall superset of political economy. Marxism is not another subset of Economics enumerating statistics and devoid of any human emotions. It is a methodology of analysing the ills that is plaguing the present society and how to end this impasse. He expressed his optimism that colonial power whatever may have the crimes of England (in case of India) she was the unconscious tool of history in bringing about that revolution. Thus for Marx the process of interdependence of nation would bring about not only benefits for the bourgeois but would hasten the social transformation of the pre Capitalist Mode of Production societies. In 1847, addressing the workers, Marx termed big industries, the free trade and world market as the ‘positive side of capital’. Without capitalism there would have been no proletariat, neither could the material means for the worker’s emancipation and the foundation of a new society could be laid. He believed capitalism as an historically inevitable, a step along the path of humanities destiny. On the whole the CMP to meet its pre destines fate, it has to become unbearable not only for the few but to the whole class of working people. Producing a masses of individuals deprived of means of living on one hand and at the other immense wealth confronting the deprived concentrated in hands of few; dominating their every aspect of life as an alien power. The world market then becomes the playground where this process finds its most brutal expression and the logical conclusion. Contradiction is pre requisite for progress. The only way a mode of production paves way for the other more superior mode of production is by the historical development of their inherent contradiction. The capitalist system continuously seeks to overcome its inherent antagonism. But its crisis keeps recurring, and assumes the form of cycle. In the Communist Manifesto Marx pellucidly explains the capitalist’s futile attempt to overcome the periodic crises. “And how does the bourgeois get over these crises? On the one hand by enforced destruction of a mass of productive forces; on the other by conquest of new market, and by the more through exploitation of the old ones. That is to say, by paving the way for more extensive and more destructive crises and by diminishing the means whereby crises are prevented”. Rising like phoenix arises the workers now not alone but as a class forming a movement that unlike all previous movement is “the self conscious movement independent movement of the immense majority.” Smashing along its triumphal march the present and all vestiges of past modes of production that hitherto were based on one class exploiting other; the proletariats march towards forming “Union of Free Individuals”, heralding the exploitation less “Associated Mode of Production.” Superior than all the other system and thus entering ushering an era of proletarian internationalism, the globalised society of the masses.